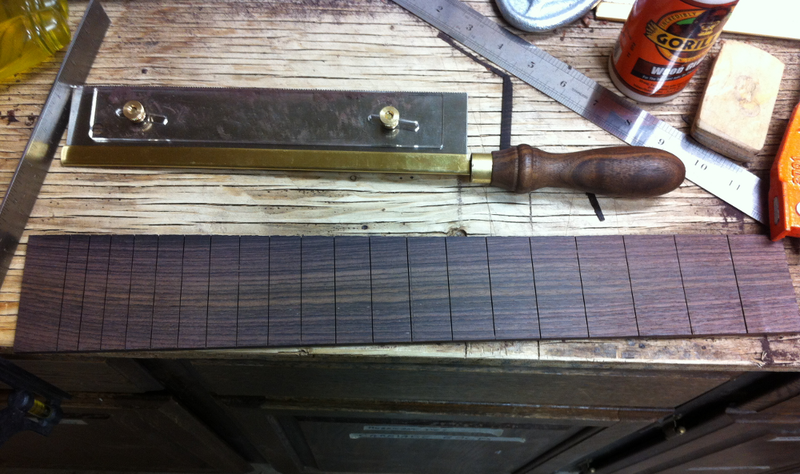 I started off planing the fretboard down to the thickness recommended by Natelson and Cumpiano. I used a benchtop planer to get it just right. Next I trued up one side of the fretboard on a sanding board and then squared off one end of the fretboard against the trued up side. 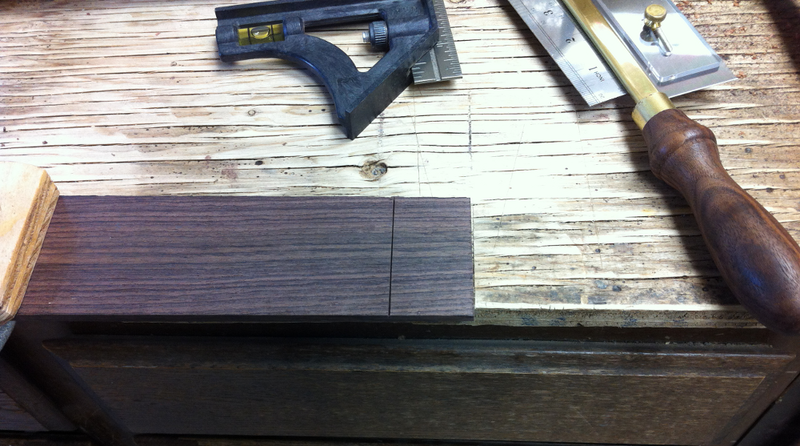 With that complete I chose a face that I wanted to be up and proceeded to mark out the frets. 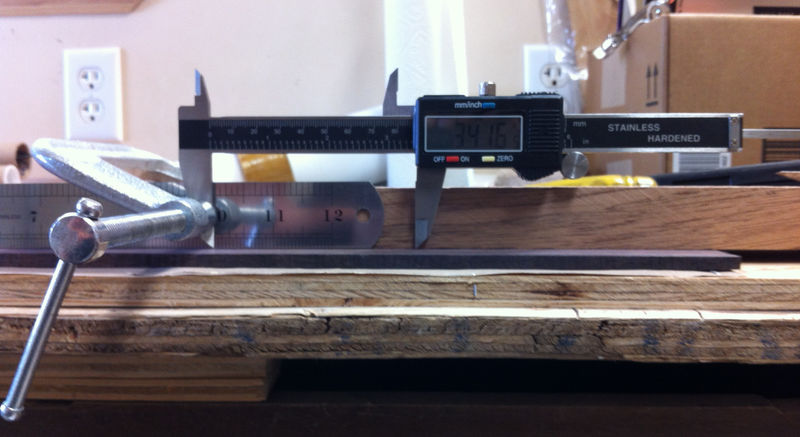 I did that using a digital caliper which I found made it way easier to mark out the decimal part of the fret distances. 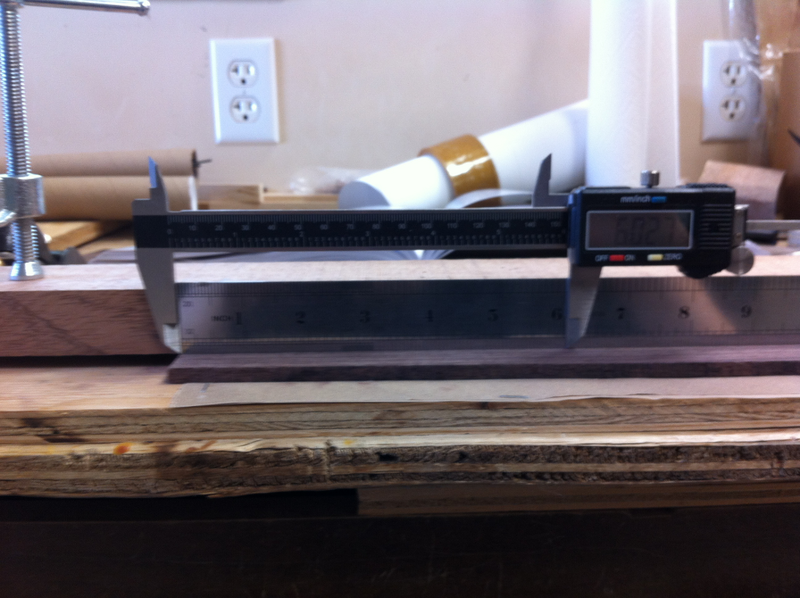 And when I got to the end of the caliper’s range I used a ruler and a clamp to move it farther down as shown below. Once I had all of the frets marked out I began to cut them. I bought a fret saw from Stewart-MacDonald that had a depth stop and I used that with an engineering square to cut them out. I was pleasantly surprised with how well that worked and how fast it went. 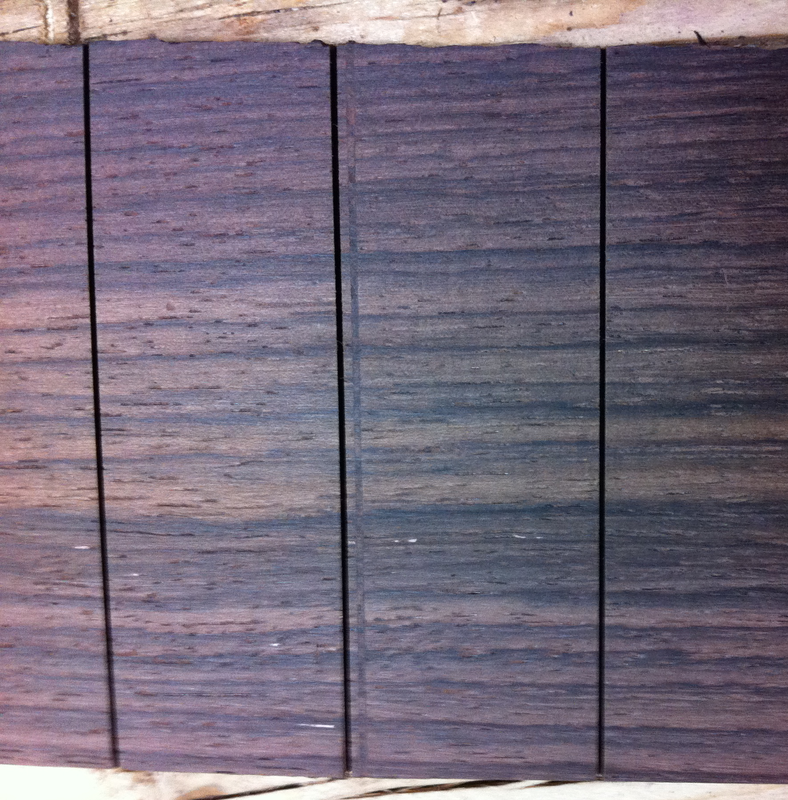 The picture below shows the first fret cut. As I was cutting out the frets I noticed that one of them didn’t look quite right so I stopped cutting and rechecked the fret spacing and sure enough I had miss-marked one of the frets. Thankfully I was able to mostly correct the mistake by gluing in a small strip of wood as the picture below shows. 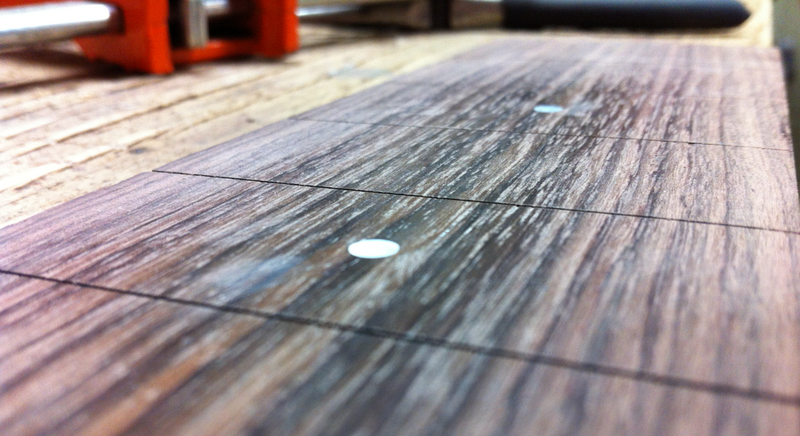 Here’s the fretboard with all the frets cut out. I trimmed off the end of the fretboard next so that it would stop about an 1/8″ above the sound hole. After that I moved on to install fret dots. I considered doing something a little more fancy, but dots are easy to engrave and as a guitar player I appreciate their elegant simplicity. To start off I drew a center line down the length of the fret board and marked out where I wanted the dots to be. Then I used a dremel tool with a router adapter to cut out the wood for the dots and glued them in. I was surprised with how easy it was to carve out the holes and quite happy that I never had to fix a mistake. I sanded the dots down and scraped them flush with the fret board. 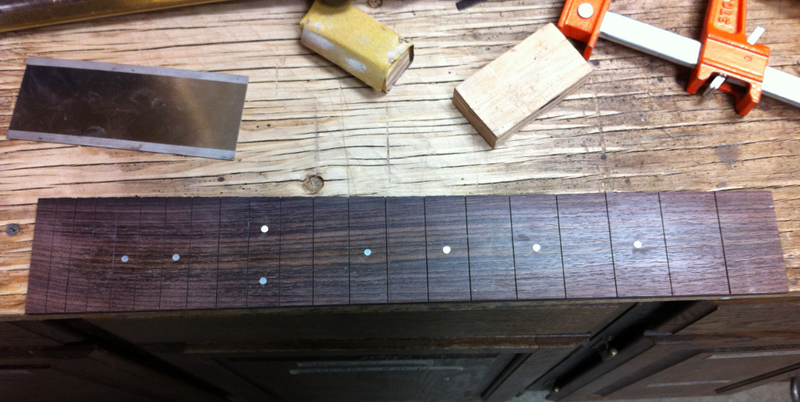 With the dots completed I continued on to bring the fret board to the correct width: 1.75″ at the top and 2.25″ at the bottom. The process of bringing the fretboard to the correct width caused me a little bit of confusion. Initially I thought that I should use the “trued up” edge of the fretboard as one finished edge and trim the other side down to the correct width. But doing that would have made the fret slots something other than perpendicular to the center line of the guitar, which is not acceptable. So after thinking about it for a while I realized that I had to shave off material from both sides of the fretboard keeping the center line of the fretboard perpendicular to the fret slots. Now it doesn’t seem so complicated, but I struggled with it at the time. Once I got the width of the fretboard cut down to size I moved on to fretboard radiusing. I wanted to have a decent radius on my fretboard because I think it makes playing much easier, I was shooting for a 9 inch radius at the top frets. At first I was going to simply make the entire fretboard a uniform 9 inch radius, but a really smart friend of mine had built his own CNC machine and it seemed like it should be possible to somehow create a compound radius on a fretboard using his CNC. A compound radiused fretboard can help get rid of the inherent non-linearity that a uniform radius will introduce when it is applied to the surface of a tapered fretboard. A picture of his CNC machince is shown below, he’s a genius. Basically the idea was to create a negative image of the compound radius in a block of wood using the CNC and then line the newly formed impression in the block with sand paper and use it to transfer the shape onto the fretboard. The block is shown below. It did the job, the hardest part was being careful not to take off too much wood on the sides of the fretboard. I think I would try this method again. To finish off the fretboard I rounded off the bottom using the compound radius block so that it had the same radius as the top of the fretboard did at that point. I would have also installed the side dots in the fretboard, but I forgot and did that after I’d already glued the neck, fretboard and body together which was my next task. With all three components essentially completed I was able to dry fit them together and do the final tweaking to the dovetail joint until I was comfortable that it was all going to work. Then I glued the dovetail joint and then the neck. I was amazed and excited at how suddenly it started really looking like a guitar. Once the glue had dried I finished off the end cap of the heel with a planer to get it flush with the back. After that I had only two major construction tasks left: creating the bridge and installing the headstock inlay. I discuss the bridge next.